Typically, you execute the deed and turn over the keys at closing. 1. What Is a Group Annuity? 3. What Are Escheat Funds? 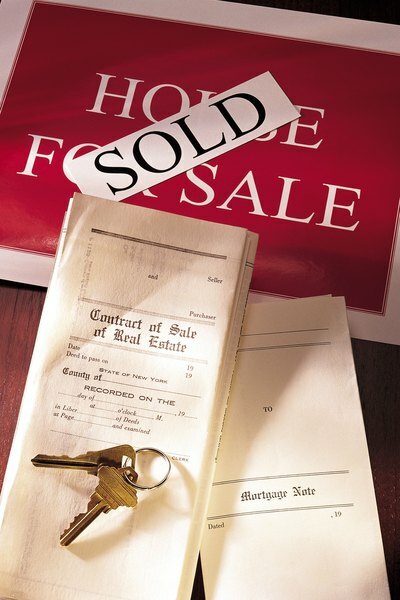 When buying or selling a home or an investment property, the seller must legally transfer the property to the buyer. The means to transfer, or convey, a property are called “instruments of conveyance” or “instruments of transfer.” A deed typically serves as the instrument that conveys title from one person or entity to another. However, easement contracts and certain contracts and affidavits also qualify as instruments of conveyance. Instruments of conveyance and transfer are commonly used to create a legally valid transfer of property from one owner to another. Generally, lawyers or paralegals under a lawyer's instruction draft instruments of conveyance and transfer as legal instruments that transfer the title from one property owner to another. These legal instruments include deeds, easements and transfer certificates. The actual conveyance or transfer occurs when the seller or his attorney hand a properly prepared deed to the new owner. Because deed and title recognition laws vary from state to state, buyers should record their deed with their county or municipality to legally notify everyone that they possess title to the property. For an instrument of conveyance to be legally acceptable, it must meet certain requirements. The instrument must show the name or names of the grantor and grantee. In addition, the grantor’s name must match the name on the title search. The instrument must include a legal description of the property, the parcel identification number shown on the property's tax records and the actual cash consideration paid, if applicable. The signature must exactly match the grantor's name and the instrument must be notarized. Some jurisdictions may require different or additional information. Buyers and sellers should check with their county recorder or a real estate attorney to confirm. Deeds include general warranty deeds, special warranty deeds and quitclaim deeds. Warranty deeds provide buyers with the greatest protection because the grantor guarantees that he legally owns the property free and clear of liens and encumbrances and could therefore be liable for any title defect. A special warranty deed promises to protect the buyer if an issue arises from the time the seller owned the property. A quitclaim deed uses much simpler language because it contains no promises or guarantees. It simply transfers one person’s ownership interest in the property to another. Less used instruments of transfer include easements and special transfer documents. Easements are rights of use over the property of another. A deed may contain an easement. However, separate easements are typically conveyed via an easement contract. Special transfer documents, which include certificates of transfer and affidavits, are often used to transfer full or partial interests in property as the result of a death. A death certificate usually must accompany these instruments for them to be recognized as fully legal transfer instruments.